Over 150 pupils from the Junior and Senior School took part in Colfe’s annual sponsored swim. The event was held over four sessions with a target of 3,000 lengths and £1,000 in donations. 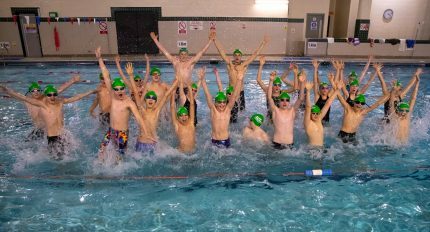 The Swim Squad – including pupils from Year 3 upwards – easily surpassed this, swimming a total of 5,499 lengths and raising an incredible £2,688. The money raised includes a donation from the Leathersellers’ Company who kindly match-funded the event. Each year the Swim Squad choose to donate money raised to different charities. This year it was decided amongst the swimmers that Macmillian Cancer Support – a charity that provides specialist healthcare, information and financial support to those affected by cancer – was the most deserving.